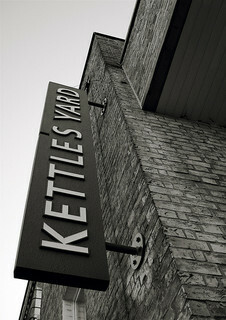 Today I visited the current exhibition at Kettle's Yard in Cambridge. Kettle's Yard is currently undergoing major development to create a new education space, and so most of the exhibition gallery is unavailable. Rather than close the gallery altogether, they are using the remaining small space to host small exhibitions of works from the extensive permanent collection. The latest of these mini exhibitions is Henri Gaudier-Brzeska: Vorticist! (closes 1 April). Kettle's Yard owns a substantial collection of Gaudier-Brzeska's work, which was produced in a startlingly short time (the artist died in active service in 1915, aged only 24). Firstly, bigger isn't always better: having just a few exhibits helped me feel able to flit between things, to revisit items several times, and to get a feeling for the whole display. In a large exhibition I feel more pressure to go round *in order*, because it's harder to get a grasp of the whole thing. Although only a small space is available, every corner of it is used, so a couple of drawings are hung in a small alcove that might ordinarily have been overlooked. This makes the space feel more dynamic, as there's somewhere slightly hidden to walk into, and it makes for a nice surprise when you notice a picture on the wall inside. The content was well chosen (I'm sure that the choice must have been overwhelming), so, for example, we get to see a sculpture along with a preliminary sketch and a drawing probably made afterwards. This emphasis on the depth of the collection, and on the artistic process, is (to me at least) more satisfying than and exhibition that just tries to show breadth. Books about the artist, the vorticists, and about early 20th British sculptors were available to browse, so visitors could find out more without having to move. All in all, a lovely trip out this afternoon. Just another sensibly-shod queer knitting musician special collections librarian. Girl in the Moon: a blog about libraries and other things by Katie Birkwood is licensed under a Creative Commons Attribution-ShareAlike 3.0 Unported License.